I ran the Oakland 1/2 Marathon yesterday, the inaugural Oakland running festival which had other running events like a relay, 5k, and of course the full marathon. I had a lot of fun, the course is super fast and flat, folks were great/happy/excited, the running shirt was nice. The support was awesome, no shortage of volunteers and spectators. I was surprised by the number of people that were out and about cheering (moreso than the San Francisco marathon). Ran into a few folks Derrick and Dr. Bean from IronTeam. Ben was at the finish line volunteering. The other day, I encountered eight (eight!) people who had come to town just for the marathon. All of them made a point of saying how surprised they were to discover what a beautiful city Oakland is. It was totally heartwarming. For whatever reason, my dream car as a kid was a candy apple Porsche 911. I'll have to say that this Porsche Spyder hybrid in whatever color for my 50th birthday (still along time away) would be pretty nice. I suspect that by the time I'm 50 there'll be an even better car. I like the Cayman S too, and the 911 Carrera 4S is not too shabby. The 918 Spyder prototype combines high-tech racing features and electro-mobility to offer a fascinating range of qualities: An emission level of just 70 grams CO2 per kilometre on fuel consumption of three litres/100 kilometres (equal to 94 mpg imp) truly outstanding even for an ultra-compact city car, on the one hand, combined with the performance of a super sports car and acceleration from a standstill to 100 km/h in just under 3.2 seconds, top speed of 320 km/h (198 mph) plus, and a lap time on the Nordschleife of Nürburgring in less than 7:30 minutes, faster than even the Porsche Carrera GT, on the other. A friend of mine was telling me that the prettiest money she ever saw was the Dutch guilder. I had to look it up and I now have to agree. Wouldn't be a bad collection to framed up on a wall somewhere. We're over at the Berkeley Bowl and I'm about to go grab some Nutella. Nutella has a low glycemic index and therefore ok to eat? That's what I told myself anyway. Next to Nutella on the shelf is Nocciolata and instead of grabbing Nutella, I grabbed it instead. 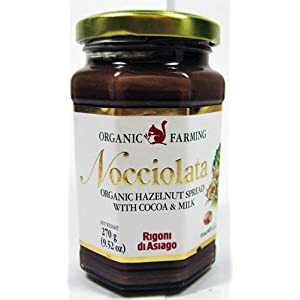 Glad I did because Nocciolata is ridiculously delicious, tons better than Nutella — game over. It's available on Amazon and it's worth seeking out. Anyway, make sure you're on a workout program before you buy a jar. 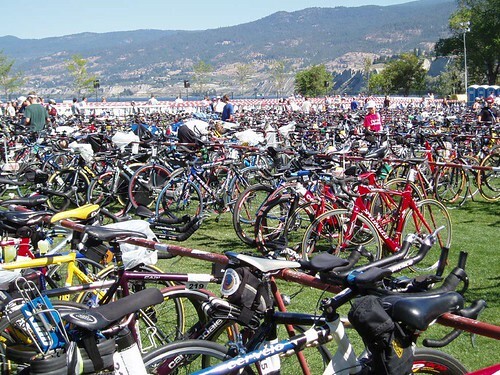 Training for Ironman St George and Ironman Canada started in earnest for me in October last year. I have this training log that I use to record my workouts. It's a pretty neat tool but could be a little faster and little more slick on the user interface side. I upload my workouts from a Garmin Forerunner which I'll talk about in another post. What's new this time around is that I'm working with a coach, Chris Hauth (a genuinely nice guy, an '92 and '96 Olympian representing Germany, and he's *won* a few Ironman races). He's coaching a few of my friends as well. The workouts have been/are super efficient in terms of time and effort, and I'm also working out strictly on heart rate and also interval training. I just don't have time for any bad workouts, and his philosophy of doing something every day and getting enough rest and recovery to move on to the next level is proving to be right. I'm also doing a bunch of (cycling) spin classes but the spin classes are based on wattage. We use a CompuTrainer in class which you attach to the rear wheel of your bike, and it adjusts the resistance on your wheel based on what watt resistance level you give it. Training by watts and high cadence and going to a ton of spin classes is also new this year. In any case, St George is coming up, May 1 and Canada is right around the corner at the end of August. Also, adding below, the difference in training with Chris vs IronTeam. We'll see if it translates into a better time. It is translating into far easier and manageable (even pleasurable) workouts. Top of lift six, Cornice Express at Kirkwood. What a great snow year in Tahoe! We've been up a few times, wished we could have gone up more. 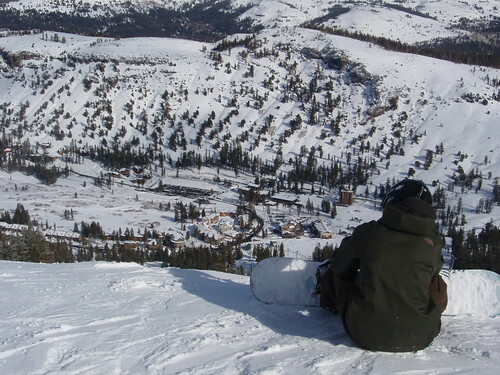 We've really only gone to Kirkwood which gets a ton of snow early in the season and it got dumped on this year, so we just kept going there. Here, I'm all Burton-ed out. Jacket is from the Shaun White collection. Shirt is a snowboarding shirt from Burton too. 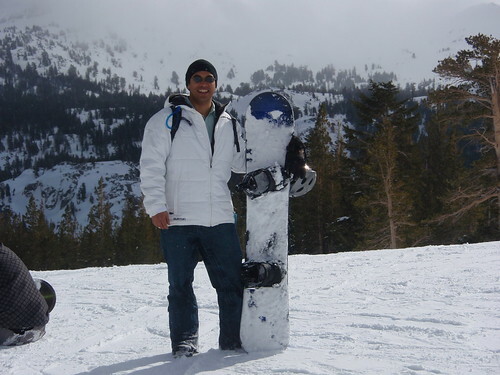 Snowboard pants are denim (goretex but it does still get cold and wet so good for warm days…but they do look cool). Boots are Burton Hail. The helmet is Giro, the bindings are Flow, the sunglasses are Oakley, the cap is from Rapha. [Apologies for the lack of writing, going back to writing now, hopefully a post a week if not more].